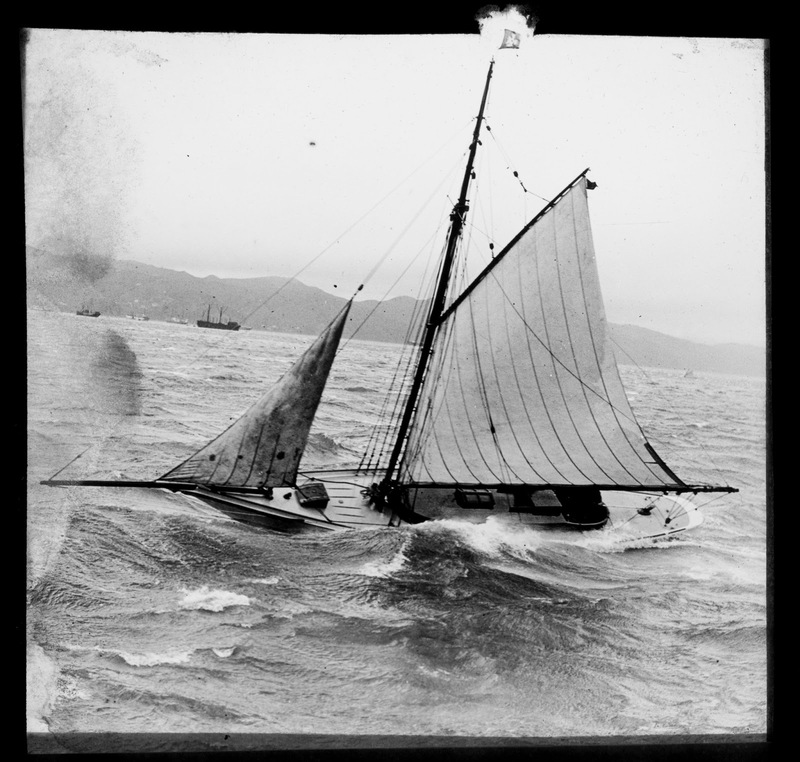 Atalanta, or "Attie" as she is affectionately known, was launched in Auckland, 7th May 1894. She was built at the yard of Charles Jr. and Walter Bailey. Brothers Charles and Walter did not get on very well, Charles was a drinker with a convivial reputation, and Walter that of a dour teetotaller. I believe they they generally worked on their own projects, though each influencing the other in the interests of the company - a kind of post-Sgt Peppers Lennon/McCartney arrangement. 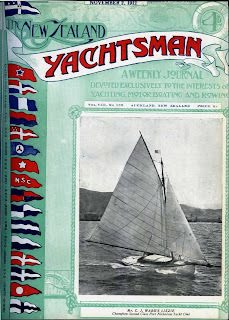 Charles Bailey Sr and Jr were there at the launching, and presented with gifts of a cigar box and a silver watch respectively, each engraved with an image of the yacht. It may have been that that Charles Sr., who had a long career behind him, including some very successful centreboard racing yachts (most famously Pet), was the primary designer, and Charles Jr, just starting out, the builder. However, Atalanta also sported long carved trail boards, carved bow, and had a stylish and thoughtful interior layout - all Walter's hallmarks. Maybe he just wasn't a party sort of guy. 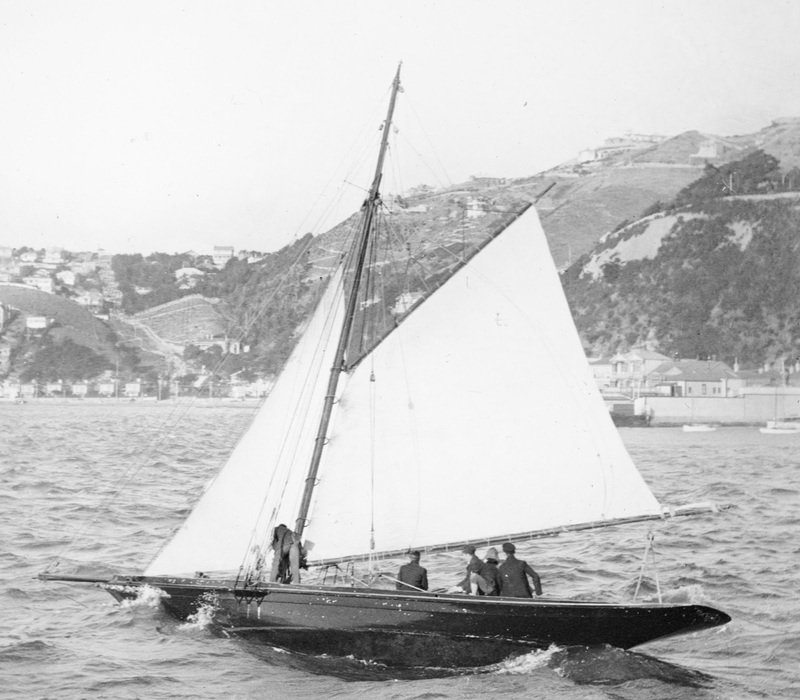 Attie was built for Napier clients Messrs J. H. Smith and J. Canning. 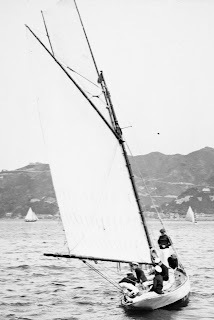 She was not long for that port - being sailed down to Wellington to compete in the Wellington Anniversary Regatta, January 1895. 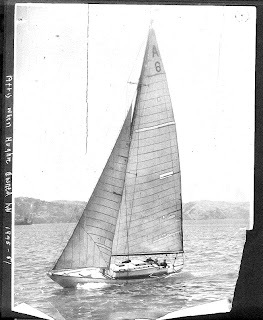 She came more-or-less in company with the Waitangi - a first class racer designed and built by Robert Logan for a Wellington syndicate solely to win the first class division of the regatta. 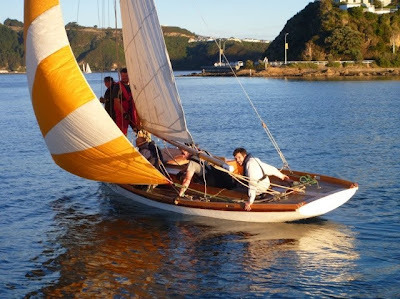 Logan was on board the Waitangi acting as navigator, and would helm her through to victory on the day. Both boats arrived 16 January 1895. Logan also had his eye on the second class yacht prize, and tweaked up the Rona (Built by him in 1893 for Alexander Turnbull) to compete for what was to be her first of many regattas. The Anniversary regattas of the 1890s were the greatest sporting spectacles of the age. 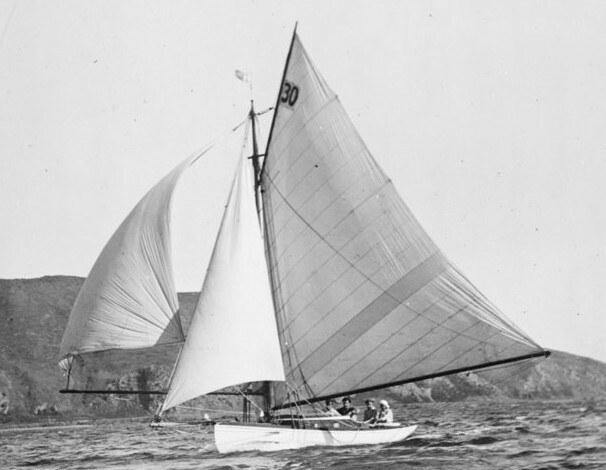 There was fleet racing for keel yachts, centeboarders, rowing and swimming events. Boats from around the Dominion would come to compete, and thousands would line the waterfront to watch. 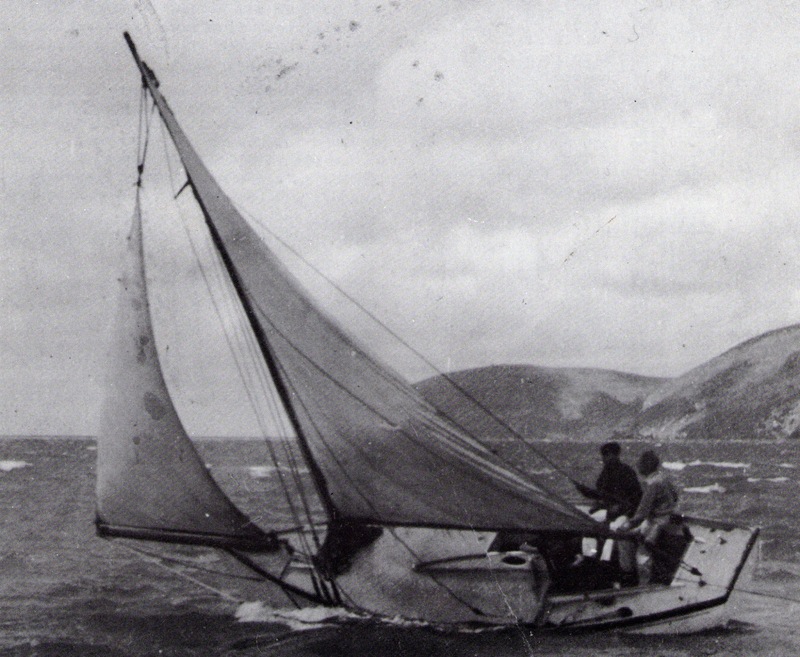 In 1895 the second class race was for boats rating above 2.5 and less than 5.0. Atalanta was rated 4.2. 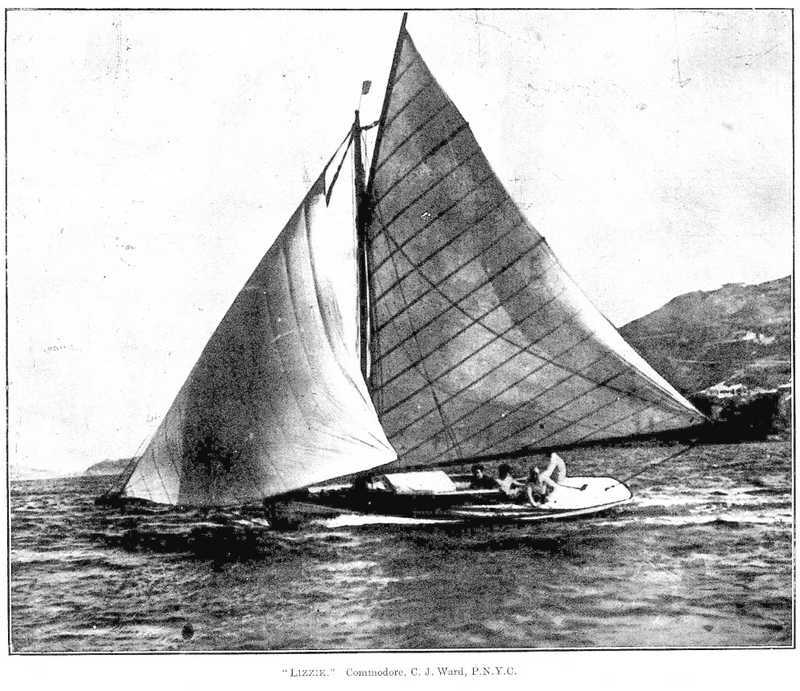 Canning had a new set of large racing sails, and briefly considered entering the first class race (rating 5.0 and over) with them. He ultimately decided on staying in the second class, but asked the Regatta committee to allow his bigger sails. This was declined, but he used them anyway. Atalanta won the race, but was disqualified. Turnbull's Rona therefore took the prize. Atalanta's owners returned to Napier, leaving her in Wellington up for sale. Atalanta was still for sale a year later, when she was entered again for the annual regatta. She was to be skippered by Winstanley, who was about to purchase her. However, when the day came, she never left her moorings. 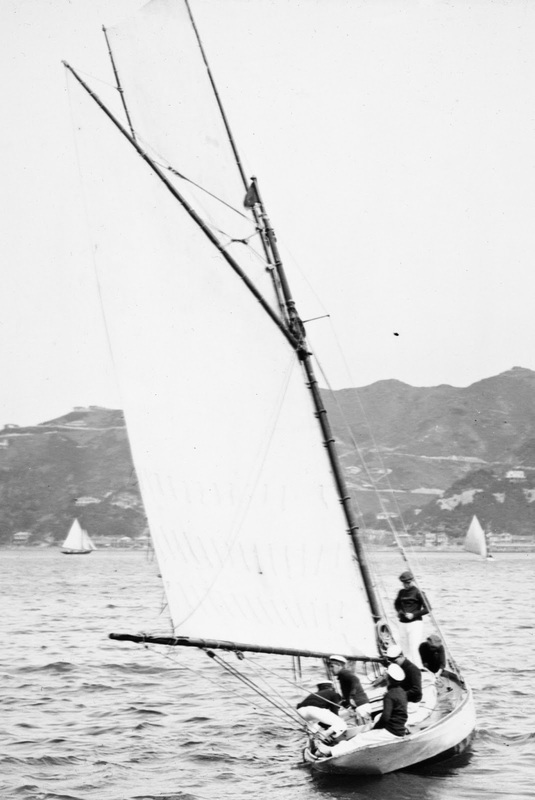 Though regularly raced with PNYC and cruised to the Marlborough Sounds under his ownership, Atalanta didn't enter the Anniversary Regatta again until 1898 when she was purchased by Otto Schwarz. That year there were two races for each division, and Atalanta won both. She came third following year. 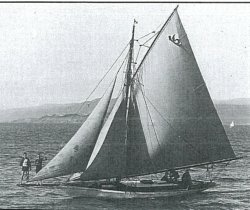 1900 she was on holiday across the Strait and didn't compete. She came second in 1901. From around 1900 there was a general decline in yachting in Wellington. There was no first class racing to speak of, the big boats of the 1890s had all but disappeared. Ngaira and Siren were of the right size, but old. The new ones, Waitangi, Iorangi, and Rainbow were the only boats which could be considered of that class, and were not raced very much. It was decided the fleet were better served by creating two divisions of second class yachts, and Atalanta was placed in the 2A division. 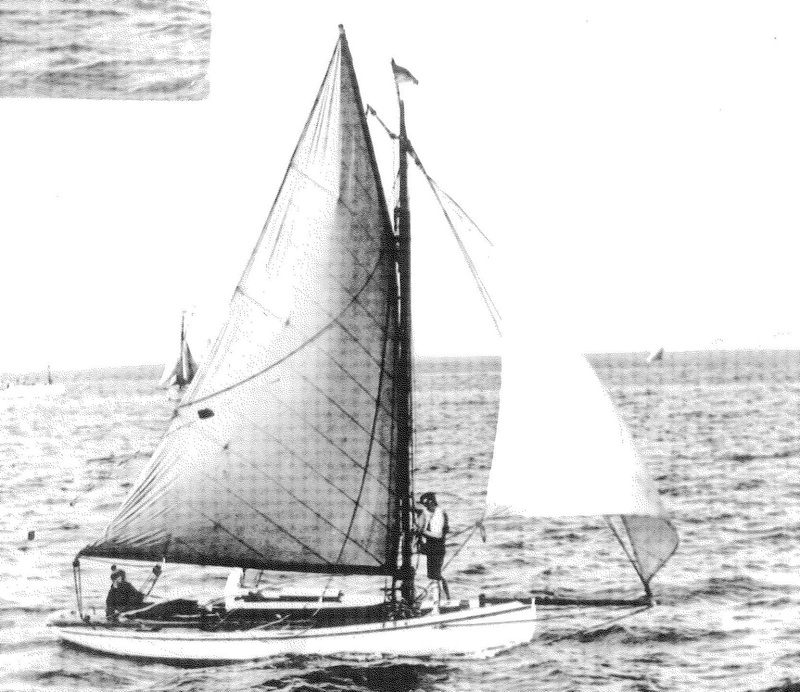 She wasn't very well served by either her owners or this new structure (many weren't), and after Schwartz sold her in 1902 she didn't really have much success outside of the offshore racing. The revival of yacht racing from around 1909 focused on small racers of about 22-30 feet LOA which established a strong second class once again, but forced larger boats like Atalanta and Rona up into a hodge-podge of a fleet for the first class. In 1914 Atalanta collided with a pilot boat. There was a great deal of argument and acrimony of the incident, and the NZ Yachtsman ultimately had to ask people to stop writing in about it. The accident left Atalanta somewhat shaken and leaky. Atalanta continued to race with both the Evans Bay YMC and PNYC through the 1920s and 30s, generally knocking about in a no-man's land between the first and second divisions. She would dominate the second, get promoted, and then be relegated. It was an era dominated by the boats of Le Huquet in the first division - stiff and weatherly. 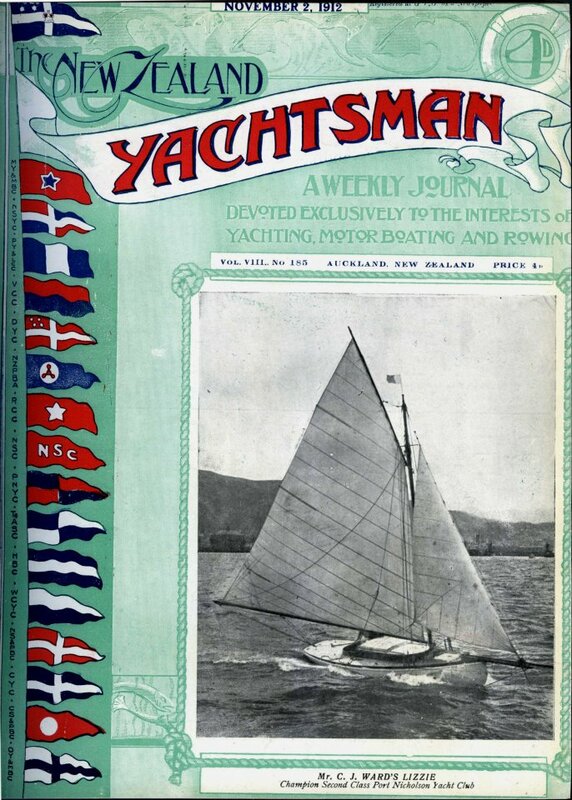 Attie had an inboard auxilliary installed in 1927, and on occasion had a bit of fun racing with the motor boats. 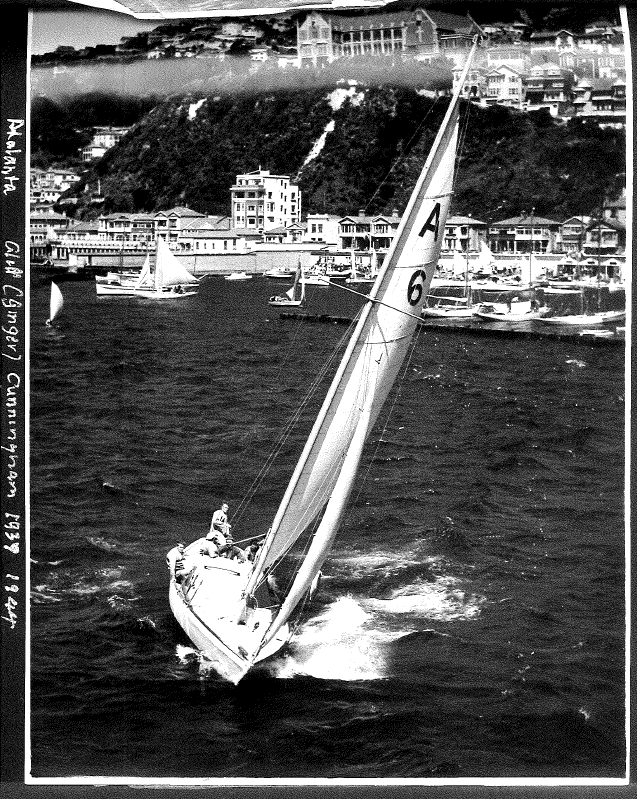 She did maintain good results in offshore racing, where handicaps were of combined fleets, and she was handled well. 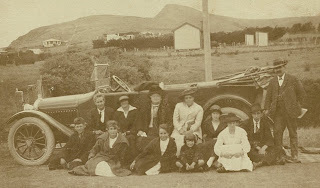 It wasn't until Cliff Cunningham, owner of a slipway at Island Bay purchased her in 1937 that she got her second wind. Cunningham set about tightening her up by refastening her. Bruce Askew says he used bronze ringnails driven into the inner skins from the inside - not what anyone would recommend, but it worked. He then stripped her out completely, and removed her engine. 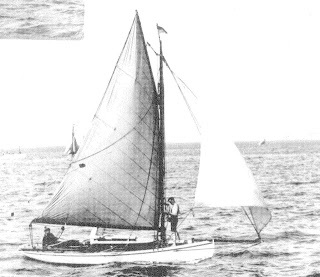 Cunningham also converted to her a bermudan rig, and fitted the main with tapered full-length steel battens. Exactly when Attie was converted from a centreboarder to a fixed keeler is not known, but it was probably during this time. 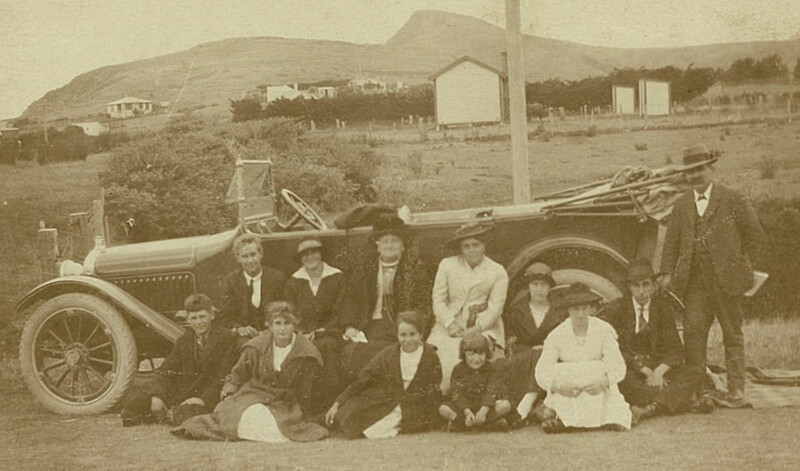 The image left shows her during Cunninghams tenure, when she was once more scratch boat. After WWII, Atalanta was purchased by Hugh Askew. 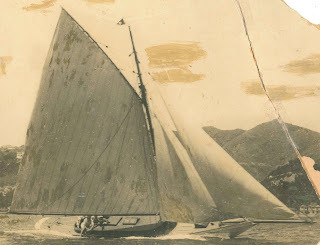 He put a new bermuda rig in her - this one towered over 60 feet, and was milled from a single length of douglas fir. He also further deepened the keel. His son, Bruce Askew, who became a successful designer of yachts, felt it was overdone. It didn't hurt her performance however. The most prestigious cup in the Royal Port Nicholson Yacht Club is the Mills Askew trophy, which is for the best season aggregate for first class yachts. When donated to the club in the 1890s by E. C. E. Mills, it was known as the Mills Challenge Cup. If you managed to win the first division season aggregate three years running, or three times in five years, you could keep it indefinitely. Hugh Askew achieved this with Atalanta in 1948 and was presented the cup. He took it away, had a drawing of Attie (it must have been from a pattern - she is pictured gaff rigged and has a spoon bow) engraved large on it, and re-gifted it to the club to be presented for season winners of the division, on the proviso that it would remain the property of the club. Since then it has been known as the Mills-Askew Trophy. Askew sold her her 1951. She was subsequently owned by Cox and Cameron and1962-1974 by Pat Millar, who continued to race her in the first division with RPNYC and Evans Bay. Her current owner, Julian Matson, purchased her in 1974 and took her first to Wiakawa, then Dunedin when he moved there.